On Wednesday I posted this photo in my facebook with the caption "2 hours later this is done! 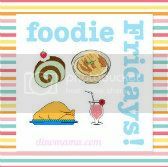 We shall see whether its tasty or not tomorrow.". This was suppose to be DinoPapa's Father's Day cake but it did not materialized. Well, its about a month late but here it is~ the mystery is revealed~ Its Blackberry Cheesecake! Thanks to Diana of Domestic Goddess Wannabe who gave me a fail proof recipe from here. I told her that it looks like an easy one to make but I am still skeptical since I am hopeless when it comes to baking; with or without using the oven. IT IS a simple and easy recipe, if I can make it, you noobs can make it too! 1. Blitz the biscuits in a food processor until beginning to turn to crumbs, then add the sugar and butter and whiz again to make the mixture clump. If using graham cracker crumbs, you can use a bowl and wooden spoon to mix the butter in, with the sugar added. 2. Press this mixture into a 8-inch springform tin; press a little up the sides to form a slight ridge. 3. 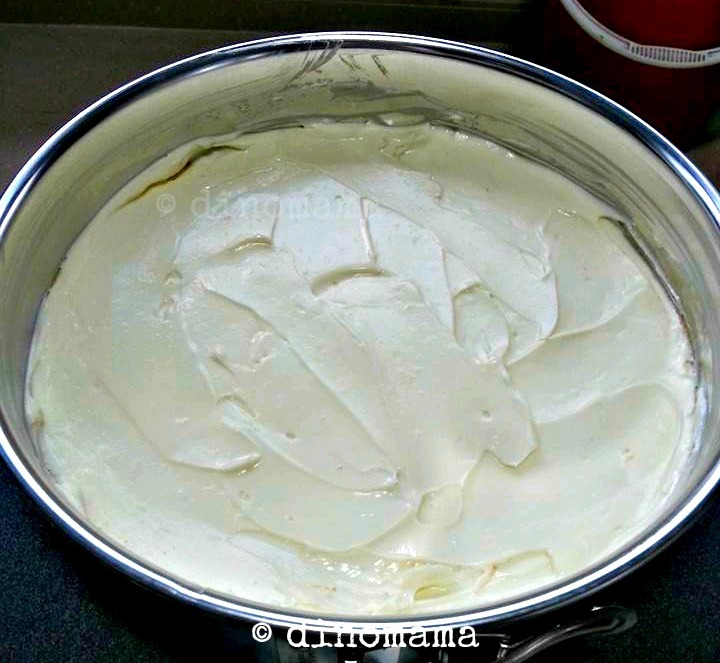 Beat together the cream cheese, powdered or icing sugar, vanilla and lemon juice in a bowl until smooth. 4. Lightly whip the cream, and then fold it into the cream cheese mixture. 5. Spoon the cheesecake filling on top of the biscuit base and smooth with a spatula, put it in the refrigerator for 3 hours or overnight. 6. 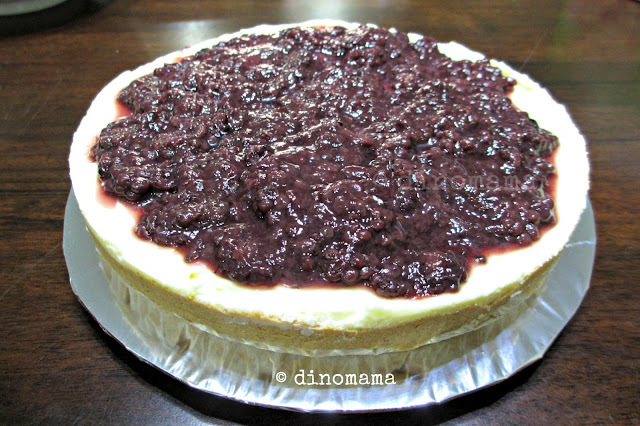 When you are ready to serve the cheesecake, un-mold and spread the black cherry spread over the top. 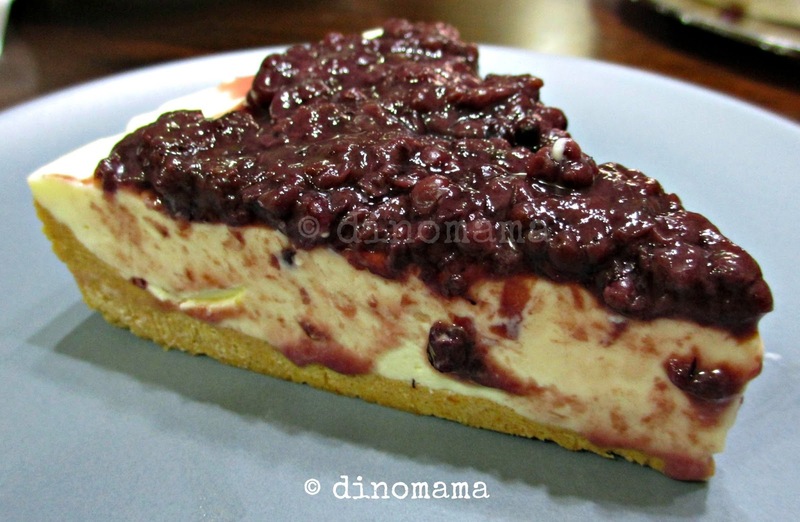 I quickly spoon & spread the blackberries on top of the cheesecake. I have to work fast as I think the cheesecake is melting a little bit, maybe its the temperature that night. So the verdict? DinoPapa was smiling and saying "mmm~ 好吃！" which means YUMMY! when he took the first bit. Then he said "there are a lot of seeds." Note to self, use blueberries or cherries next time. Another note to self, please see properly the label before buying.... ya, I grabbed the wrong can, wanted blueberries but took blackberries instead. I am not a cheesecake lover but I must say MY cheesecake is delicious! Would you like to have a piece? I don't like cheesecake but this does look delicious! I linked up my Ribfest experience last weekend... yummmm! Hmmmm this sounds so delish. 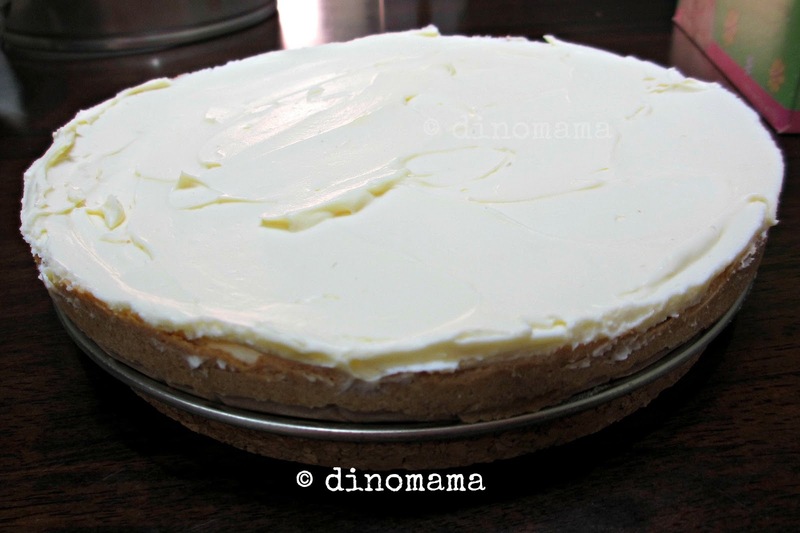 I love cheesecake and what a delight to experience this fab recipe with you. Thank you so much for sharing. I am from the Ultimate Blog and so nice to meet you. Thanks fro dropping by Wendy~ Try this recipe and let me know if its as good as those baked cheesecake. Yummy!!! The blueberry against the tangy cheesecake.... brilliant!! It looks like you are far from hopeless when it comes to baking! Too bad the yummy slice can't be scooped off of the computer screen. Thank you for sharing. hahaha~ that's a huge encouragement Donovan! I am glad that my cheesecake looks so good even on the screen.